We are on Straitstimes news paper again. Future Academy focus on high quality small group tuition conducts by high profiled tuition teacher. In recent years more and more benefit from and appreciate our service a lot. Here is the full article. 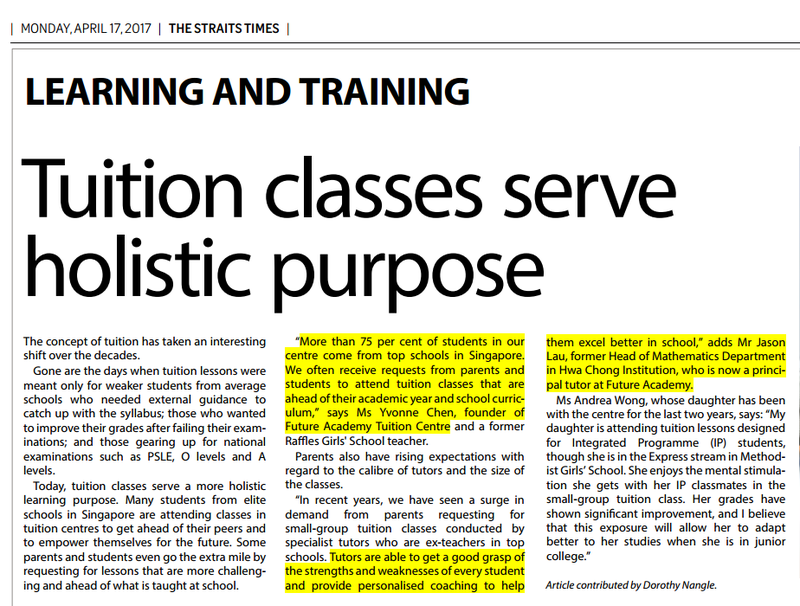 Future Academy tuition centre on The Straits Times. The concept of tuition has taken an interesting shift over the decades. Gone are the days when tuition lessons were meant only for weaker students from average schools who needed external guidance to catch up with the syllabus; those who wanted to improve their grades after failing their examinations; and those gearing up for national examinations such as PSLE, O levels and A levels. Today, tuition classes serve a more holistic learning purpose. Many students from elite schools in Singapore are attending classes in tuition centres to get ahead of their peers and to empower themselves for the future. Some parents and students even go the extra mile by requesting for lessons that are more challenging and ahead of what is taught at school. “More than 75 per cent of students in our centre come from top schools in Singapore. We often receive requests from parents and students to attend tuition classes that are ahead of their academic year and school curriculum,” says Ms Yvonne Chen, founder of Future Academy Tuition Centre and a former Raffles Girls’ School teacher. Parents also have rising expectations with regard to the calibre of tutors and the size of the classes. “In recent years, we have seen a surge in demand from parents requesting for small-group tuition classes conducted by specialist tutors who are ex-teachers in top schools. Tutors are able to get a good grasp of the strengths and weaknesses of every student and provide personalised coaching to help them excel better in school,” adds Mr Jason Lau, former Head of Mathematics Department in Hwa Chong Institution, who is now a principal tutor at Future Academy. Article contributed by Dorothy Nangle.